Replot bridge is a 1045 m long cable-stayed bridge, and is the longest bridge in Finland. The bridge was taken into use in 1998, and is a link between the islands Replot-Björkö and the mainland. Replot Bridge was built in order to replace the ferry that was frequently used. Replot Bridge is carried by a total of 13 enormous concrete supports, two embankments, nine extra supports and two pylons. Most remarkable are the 82.5 m tall pylons. The midsection of the bridge is supported by thick steel beams which are attached to the two pylons. The bridge is supported by a total of 64 cables, the longest being 127 m in length. The deck is 12 m wide, of which 8.25 m is used for vehicles and 3.75 m for bicycles and pedestrians. The clearance under the midsection is 26 m.
The Valsörarna island group is located at the outermost reaches of the Kvarken, approximately 15 kilometres northwest of Björkö. The Valsörarna islands has a diverse nature containing wetlands, birch forests, stony shorelines and sheltered bays etc. The “Lovepath” that goes between the coastguard station on Ebbskär and the lighthouse on Storkär reveals most of the types of nature found on Valsörarna. Since 1948 Valsörarna has been a bird protection area and is now part of the Valsörarna – Björkögrunden nature protection zone, comprising a total of 600 hectares of land and 17,200 hectares of water. The Valsörarna landmark is the red painted iron lighthouse (36 m tall), which was constructed in 1886 in Paris by the same company that also built the Eiffel Tower. However, the lighthouse is no longer in use. The former sweeping light has now been replaced by a flashing light for the sake of small boats. It is prohibited to visit the islands during the nesting season 1.5-31.7; the only exceptions being the following: The coastguard station on Ebbskär, the harbour inside Garpören, Båthusviken on Storkär and Malskär with its anchorage and harbour. Permission must be obtained from the Provincial Government for overnight visits. Valsörarna is an old cultural landscape, where the nature is now taking over. Here, permanent lighthouse keepers and Björkö residents once collected hay and put their animals out to pasture. 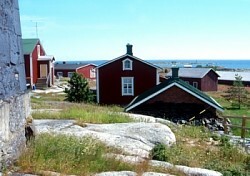 The coastguard station is characteristic for Valsörarna today. The Valsörarna biology station, which is owned and maintained by Ostrobothnia Australis in Vaasa, can be found on Ebbskär. The Norrskär island group comprises the two large islands Östra Norrskär and Västra Norrskär as well as several smaller islands. This island group is the most isolated in the Kvarken region. The Norrskär region has always been rich in fish and has been used earlier as a base for Baltic herring fishing during the summers. Today, the fishing cottages are mostly used as leisure time houses. The Norrskär lighthouse was completed in 1848 and is located at the highest point of Norrskär. The lighthouse is built from brick and granite and stands 21 m tall. Earlier the lighthouse was maintained by four men who lived on Norrskär with their families throughout the year. In 1987 the lighthouse was automated and the last lighthouse keeper left Norrskär. A pilot station has also existed on the island until 1982. Then the piloting work was taken over in the Kvarken region by the Vasa pilot station in Södra Vallgrund. Norrskär was also a military area from the time of the Second World War. The military left Norrskär in the year 2000. Norrskär with its rich bird fauna and sensitive nature is a suitable destination only for small guided tours or private visitors.